This is the public profile of Shinjae Kang, Heeyoung Choi, Additional information and high-resolution images are available for accredited press members, to access additional information about Shinjae Kang, Heeyoung Choi please login as a press member. About Shinjae Kang, Heeyoung Choi : VOID planning is a design company based on Interior Architect. 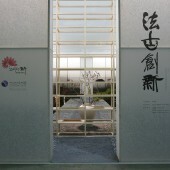 The design has been inspired by nature which is beautifully well blended with traditions of Korea. Focus on the details of beauty with creativity, characterises their inspiration. Achievements include international awards experiences such as Contract 'Best awards' 2006, Bronze and Silver prizes of JCD(Japan Commercial Design) Awards 2003, 2004 and also nominated 2007 'The Great Indoor Award'. Latest additions include the launch of visual art department in Mar 2014. Press Members: Request an exclusive interview with Shinjae Kang, Heeyoung Choi.